Each IT specialist knows, that the Product Owner, Client or Company can change details of the product during the development process some times. 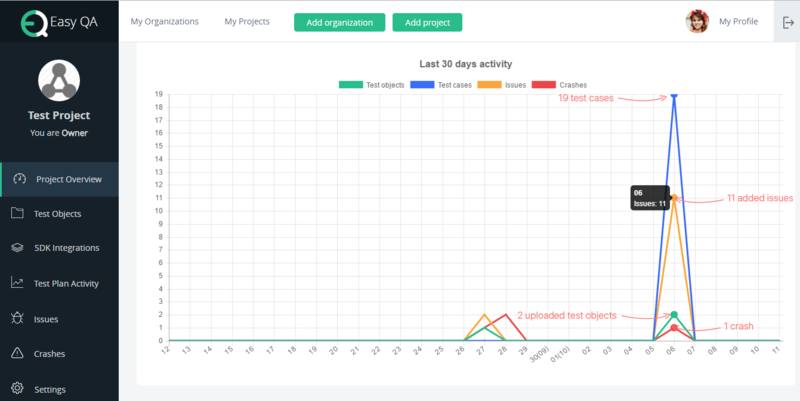 In such case, it is very important to track a progress of the project. Using info about actual states of tasks, bugs and crashes you will have a chance to change the strategy of the development process in time. EasyQA test management tool uses different types of diagrams to track progress as it is very convenient and helps remember data better. You can view the graphics of test objects, test cases and test crashes quantity and compare them at the Home page after creating an organization and managing projec. Using this info you can monitor the progress of the development process and make a decision to continue it in such way or change some parameters. For example, if you see, that the last test object has to many bugs or crashes, something happens. The reason can be physical (e.g. a developer has not enough time) or psychological (e.g. the task is not interesting). In addition, you can add Test Objects here as well as invite or delete project team members. How to write test case and choose its type? An example of a positive test case: a user enters valid data to log in (a user enters a correct username and a correct password). After Test Run is finished, its results are automatically displayed as a diagram – so it’s really convenient. You can edit the Test Run and print the diagram. passed case – a user has logged in after entering a valid username and password. failed case – a user can’t upload and save an image in the profile. blocked case – to change the image in the profile is impossible (can’t be checked as the previous test case on uploading an image is failed). Everybody knows that reports are important for the team of developers as well as for a client to track progress of the project in time. That’s why EasyQA test management tool pays a special attention on this topic. You can immediately view the diagram you need. There are Download and Print buttons. EasyQA test management tool now has a beta-version and it is free of charge. Register and try EasyQA product and all our diagrams and graphics to track progress of the development process. Statistic data and quality control visualization helps perceive numeric data better and facilitates data analysis, progress tracking and forecasting. EasyQA as a test management tool is created to make complicated things simpler, and that’s why it has such tools as graphics and diagrams which are easy to set for the currently needed info visualization. You can also compare the informative and other features of popular services by reading our article about Best Test Management Tools.